Now that Area 51 has been declassified, we finally have proof that what they did had nothing to do with aliens. Today we're going to soar above the alkaline flats of the Nevada desert at speeds in excess of Mach 3, banking and weaving among the peaks, and come in for a landing at runway 32R at airport designation KXTA. We're inside the restricted airspace of the Nevada Test and Training Range, operated from nearby Nellis Air Force Base. Commonly called Area 51 by the general public, this well-developed base on the shore of dry Groom Lake is one of the most famous mystery sites in the world, shrouded in rumor and wild claims of aliens and conspiracies. In 2001, two friends and I took a Cessna Skyhawk from Las Vegas to Tonopah, closely skirting the border of the restricted airspace surrounding Nellis AFB. This happened to be just prior to the 9/11 terrorist attacks, at which time the restricted airspace was greatly expanded, and the route that we took then is no longer possible today. But at the time, flying past the radar facility atop Bald Mountain, we were able to legally look right down into Groom Lake, and took plenty of photographs and video. We were contacted by the air traffic control tower at Groom Lake, which was plainly visible from our position, and he asked us what our destination was. We told him Tonopah, and he asked if we'd like him to give us a direct vector to Tonopah. This was his way of saying "Maybe you'd like to veer away and go straight to Tonopah rather than hugging our border." But as we weren't doing anything wrong, we declined his offer and finished out our original flight plan. We saw a number of other landing strips scattered about inside Nellis, but none that were as well developed as Groom Lake. Why were we able to do this, at a base that everyone believes is so top-secret? Everyone says the government denies its existence or that it doesn't appear on maps. There is indeed one very big secret at Area 51. In the words of Joerg Arnu, founder of the Dreamland Resort website: "The biggest secret about Area 51 is that it was never secret." The Central Intelligence Agency's Project AQUATONE had resulted in the design of what would become the U-2 spy plane, but for security reasons, they wanted someplace more private than Edwards Air Force Base to develop it. In 1955, a team led by Lockheed's chief designer, the legendary Kelly Johnson, flew around Nevada looking for an alternate site. They found one inside Area 51: the dry Groom Lake, which they described as "A perfect natural landing field... as smooth as a billiard table without anything being done to it." It was hidden behind hills and well protected inside the surrounding military reserves. As construction began, the Atomic Energy Commission sent out a press release to 18 newspapers and radio stations announcing the facility. To attract all the civilian employees who would be needed, Kelly Johnson named his new creation Paradise Ranch. And, in the more than 50 years since then, workers typically refer to it informally as The Ranch. But it's had many names. By 1956 it had grown enough to be legally listed as Watertown in the Lincoln County records. Nellis pilots often refer to it as The Box or Red Square into which they don't stray, and security personnel have been heard to call it Home Plate over the radio. One official reference to the name Area 51 does appear in a 1967 CIA memo (control number BYE 2369-67), discussing the transfer of three A-12 aircraft to be flown directly from Area 51 to Kadena Air Base in Okinawa with three aerial refuelings en route, for the purpose of reconnaissance over North Vietnam. In the 1970s its official name became Detachment 3, Air Force Flight Test Center, and it's now officially called simply the National Classified Test Facility. But since employees there have security clearances and are not allowed to discuss their work, you'll never hear anyone give that name. They usually call it The Ranch or The Site. The general public still calls it Area 51, or sometimes Dreamland. Security and confidentiality have been constant throughout Groom Lake's history. Nobody outside the base has ever had access to whatever work was being done inside, and for a long time, everything that had ever happened there was classified. So conditions were ripe in 1989 when a guy named Bob Lazar told a Las Vegas television reporter that he'd been working there for the past year, reverse engineering alien spacecraft to learn how they worked. For years, Lazar enjoyed a good run of television guest appearances and other publicity. A lot of people in the UFO community really wanted to believe Lazar's story, as it so perfectly confirmed their conviction that aliens visit the Earth and that the government covers it up. But everyone who seriously fact-checked Lazar's claims — even including Stanton Friedman, the elder statesman of the alien UFO community — found that nothing Lazar said stood up to scrutiny. There's an excellent article on the Dreamland Resort website that summarizes Lazar's abundant disproven claims including virtually every detail of his own background, his profound misunderstanding of particle physics and quantum theory, and various inconsistencies in his story. Lazar's story crumbled even further beginning in 1991 when much of the cloak of secrecy over Groom Lake's activities was finally whisked aside. A program called OXCART was declassified, which was the development of the A-12 aircraft and its slightly larger and more capable successor, the SR-71 Blackbird. On the heels of the U-2 program, Kelly Johnson had been tasked to come up with a plane that could fly high enough and fast enough that it couldn't be shot down. The declassified history confirmed that this is what Groom Lake had been up to throughout the 1960s and 1970s, which didn't really surprise anyone who follows legitimate aerospace research. The A-12 and SR-71 aircraft had been well known publicly for decades; and since no other airfields had ever been involved with their development, Groom Lake had to have been where it happened by a simple process of elimination. In 2007, employees were released from their confidentiality agreements, and retirees now speak openly about their work there, supported by rafts of declassified documents and photographs. Many of the old timers belong to Roadrunners Internationale, an association of the cold war heros who worked at Groom Lake. Not surprisingly, Bob Lazar's name does not appear among their member rolls. Instead of enjoying a great book that the DOD and DOE families can be proud of and share with their families, the aging Roadrunners are having to show up at Jacobsen's book signings, not to promote her book, but to set the record straight and clear their names and legacy. Shame on you Annie Jacobsen and Little Brown. But what has gone on at Groom Lake since the termination of the SR-71 program? At least a few other projects have been declassified. Captured Soviet MiG-17 and MiG-21 fighters were tested there. The F-117 stealth fighter, declassified in 1988, was developed at Groom Lake under the code names HAVE BLUE and SENIOR TREND. The stealth technology demonstrator TACIT BLUE also lived out its short career there, and was declassified in 1996. Official Air Force biographies name a number of pilots who were assigned to Detachment 3, Air Force Flight Test Center, including "Broadway" Joe Lanni who flew 10 different classified types there between 1992 and 1997. This is public information. This whole time, Arnu watched the white strobe light's movements correspond with the radio transmissions, then finally saw it come in to land at 8:10pm. Now of course the slowmover and fastmover could be anything, but whatever they were, it was deemed necessary to refer to them only by these code words. Typically, such transmissions would explicitly give the aircraft type to avoid any ambiguity. Certainly it would be consistent with all that's known about Groom Lake for the slowmover and fastmover to be classified aircraft types, undergoing development. 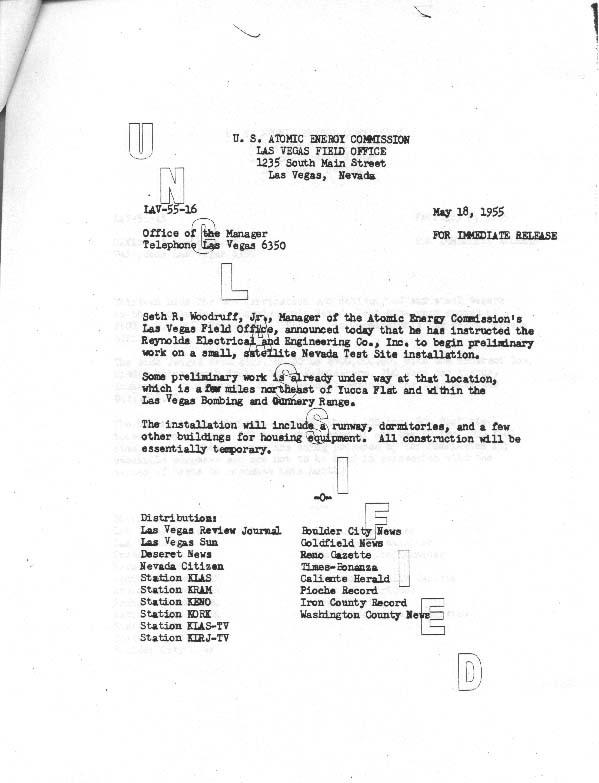 Everything that's known and documented about Area 51 is consistent with exactly what we'd expect the United States government to have: a testing facility under high security for the purpose of developing its classified aircraft. All other suggestions about Area 51, pertaining to aliens, flying saucers, or any other science fiction notions, are unsupported by any evidence. Indeed, the known activities alone can more than account for the size and scope of the facility, so it's hard to imagine how and where anything the scope of alien spacecraft would take place. My conclusion is that the implausible speculation is but a poor substitute for appreciation of the real contributions to aerospace history made by the workers at Groom Lake. CIA. OXCART Reconnaissance of North Vietnam. Washington, DC: Central Intelligence Agency, 1967. 15. DOE. Origins of the Nevada Test Site. Washington, DC: United States Department of Energy, 2000. NRO. Comparison of SR-71 and A-12 Aircraft. Washington, DC: National Reconnaissance Office, 1967.